This section contains essential information about making DNS changes to your web site. To access DNS Administration, click on the "Server Manager" icon, followed by "DNS Administration" link. 1. The full hostname followed by a period: full.hostname.com. Both records do the exact same thing. The sections below may discuss only one method but either is acceptable. Hint: If you are unsure how to enter a record, look at the existing records in the table for guidance. Note: If you have IPv6 ip adress use AAAA record instead. Important: You must put a period after the hostname. Do not put periods after IP addresses. CNAME records make it possible to access your domain through ftp.yourdomain.com, mail.yourdomain.com, etc. Without a proper CNAME record, you will not be able to connect to your server using such addresses. The first method allows you to simply enter the subdomain. Do not put a period after the subdomain name. The second method requires you to enter the entire hostname, followed by a period. NS records specify the authoritative nameservers for the domain. Important: Changing NS records may cause your site to stop working. There is generally no need to change NS records. Be sure to put a period after the nameserver hostname in a NS record (ns1.site-helper.com. and not ns1.site-helper.com ). Free e-mail services such as everyone.net require MX changes be made in order for their software to work. This change allows mail destined for your domain to be directed to their server. Please note that changing MX records may prevent your current POP3 accounts, forwarders, autoresponders, and mailing lists from functioning. To add MX record type in the hostname, followed by a period, given to you by the e-mail provider. Then select the priority level (usually 10) from the dropdown box on the right. The priority level will also be given to you by the e-mail provider. Click "Add." Note: Be sure to put a period at the end of the hostname. To restore the original MX settings, enter yourdomain.com. and priority 0 after deleting the other MX record. Note: The IP address is reversed in the first field. Please use a period after your hostname (second field). The “in-addr-arpa” method is the most frequently used. 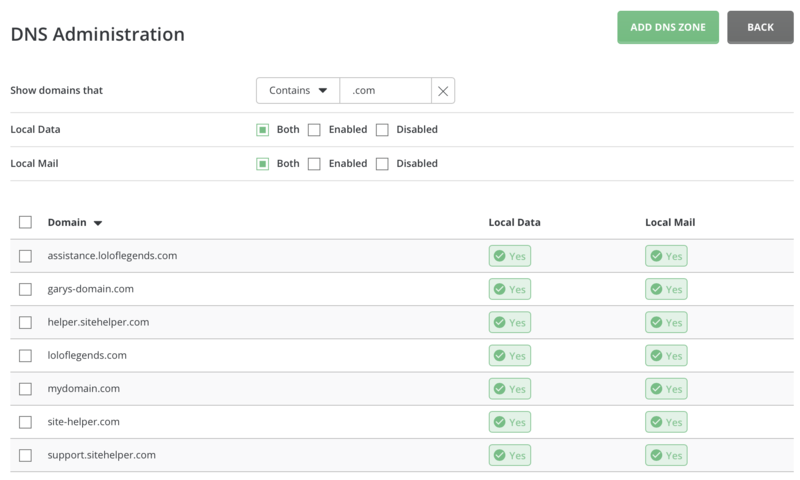 Important: PTR records are effective only if your site has its own IP address. Important: PTR records are only effective if named.conf is manually edited and the proper zone information is added. This can only be done by a root user (the server Admin). Note: TXT is often used to set up Sender Policy Framework (SPF) record, which are used to validate legitimate email sources from a domain. SRV records provide a standard way of allowing services to use different values, and for a program to determine what those connection values are. The Red portion of the contains the service, protocol, and name, in that order, separated by the period '.' character. where any left-side value that does not end with a period '.' will have the zone name appended to the end. The "target" value can be any domain value, but should resolve using an A or CNAME record. The same rule about the value ending in a period applies, and would be mandatory if the target is on a different domain name. There are more recrods which are disabled by default in DirectAdmin. However, you can enable them manually if you want to. DNS Certification Authority Authorization (CAA) is an Internet security policy mechanism which uses resource records in the Domain Name System (DNS) to allow domain name holders to specify which certificate authorities are authorized to issue certificates for that domain, and which types of certificates they are able to issue. You can manually enable CAA record in DirectAdmin by following this guide. You can manually enable TSLA record in DirectAdmin by following this guide. 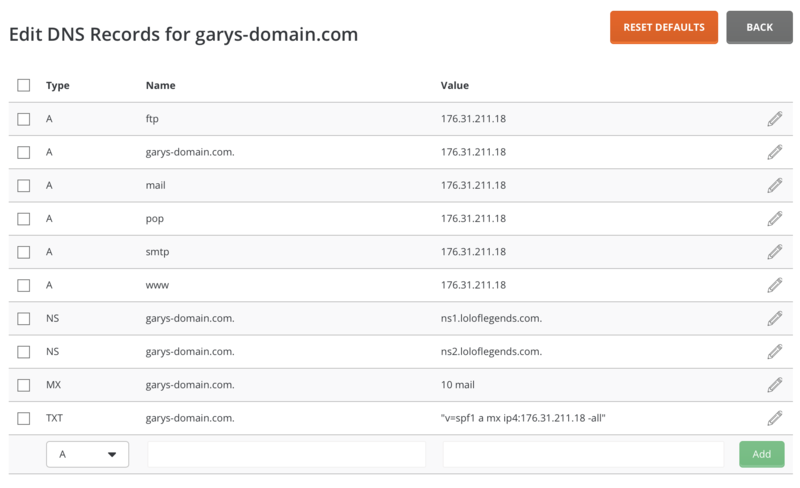 Multi Server setup let you share a copy of DNS zone to the server you add. 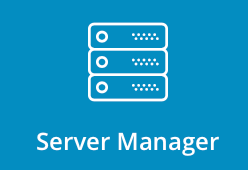 In order to access setup page, click on the "Multi Server Setup" link in "Server Manager". From there you will see list of your currently added servers. To add new server click on the "Add New Server" button. 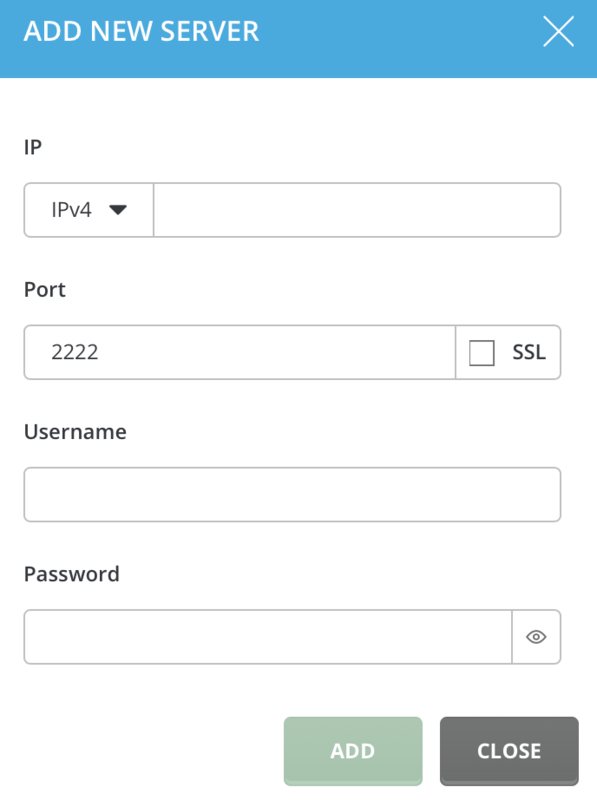 Enter your server IP, port, Username and Password. Check that info is correct and click "Add" button. You can find more information about how multi server dns clusterin works here.